Volunteers are the heart and soul of of the Edmonds Historical Museum. They have many different roles, and we are thrilled to be able to celebrate them in our regular spotlight column. If you would like to join our amazing team of volunteers, email us at Volunteer@historicedmonds.org or fill out an application online. It’s FUN, FREE and REWARDING! You might have seen her around town shopping at the Edmonds Museum Summer Market, at the museum slinging drinks during Member’s Only Exhibit Previews or greeting visitors Sundays in the Lower Level Exhibit Gallery. Most recently she was in her element at our first annual Archaeology at Night! event educating people of all ages on her archaeological specialty: bottles. Emily gives back to her local museum in a multitude of ways. Her tireless effort in supporting the museum and its mission, while promoting the history of this community is very much appreciated and noted! When did you start volunteering? I started volunteering in 2011. I had just finished the University of Washington’s Museum Certificate program, and wanted to get involved with my local museum. Where were you born? I was born in Stettler, Alberta, Canada. How long have you lived in the area, do you have any connection to Edmonds? I’ve lived in Edmonds since 2009, but my family is from the area. My grandfather, Willard Edward Dewey, lived in Lake Forest Park and worked in Edmonds; my mom and her siblings would drive their T-Bird to Edmonds for sporting events. I’ve lived in the Greater Seattle area most of my life. Map of Stettler, Alberta, Canada. Why or what motivated you to start volunteering at the Edmonds Museum? I was searching for a way to get more involved in my community, while pursuing my interests. As an archaeologist I enjoy history and living heritage – and there’s no better place in Edmonds to find those combined passions! What is a favorite memory of volunteering with the Edmonds Museum? That’s a hard one! – I’ve met so many wonderful people, and participated in many diverse events. But, I would say riding on the museum float in this years Edmonds Kind of Fourth parade with my children was one. Another would be working with the Director Katie to produce the newest annual event: Archaeology at Night! What is the most surprising thing you have learned about the Edmonds Museum since you started volunteering? That most of the collection is rarely displayed in the museum! Only a small percentage of artifacts are displayed in exhibits throughout the year. Museum’s Carnegie Library Float in 4th of July Parade, 2018. What do you think people might no know about the Edmonds Museum? 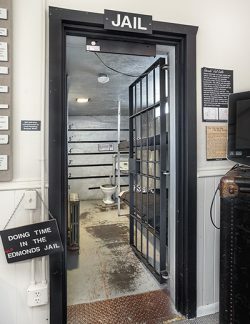 Well, I don’t think people know we have a jail cell on the lower level which is a recreation of the exact jail that was in use from 1920’s to the ’50s in the same exact spot. Or, that the museum is more than just the four walls of our historic building – we put on the Summer & Garden Markets (the museum’s biggest fundraiser! ), have a traveling trunk, or that we have booths at various events such as the Waterfront Festival. What is something people might not know about you? I am a HUGE Star Wars nerd! And, each summer my kids and I dress up like pirates to go to a local Renaissance Faire. Also, I was recently a delegate with the Edmonds Sister City Commission’s historic trip to Hekinan, Japan. What would you say to someone thinking about volunteering with the Edmonds Historical Museum? DO IT! There’s so many ways to get involved – not just sitting at a desk. The museum has numerous projects you can get involved in – working a special event, leading group tours, helping at the Information Booth at the Markets or working on custom projects! There’s always something going on and fun to be had! Volunteers at the Edmonds-South Snohomish County Historical Society & Museum fun, energetic; they have the ability to work with diverse groups and the desire to share Edmonds and its history to the public. Becoming one is simple, free and rewarding! Fill out an application online or pick-up one at the Museum today! Top: Emily dressed as a Samurai in Japan. Bottom: Museum’s Interactive Historic Jail Cell.